ABB has announced that it has succeeded in designing a standard compact solution for solar cell manufacturing plants. 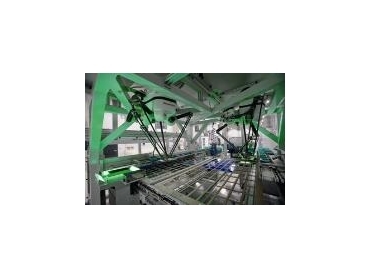 The standardised robotic cell was specially designed for loading, unloading and handling processes in automated production lines for solar cells. With the increasing demand for solar power, the photovoltaic industry is under enormous pressure to lower production costs while simultaneously increasing productivity and quality. For years ABB has been making advancements in the development of innovative solutions for the use of robots among other areas in the production of solar cells. With the compact cell FlexPicker-System Solar, ABB has succeeded in designing a standard solution for solar cell manufacturing plants. The base frame of this standard solution is a low-vibration, symmetrically designed steel structure with the dimensions 1400l x 1400w x 220h cm. The system has three levels of equipping. The lower third offers enough room for the ABB IRC5 control unit without housing. This includes the Panel Mounted Controller and other control components such as image processors, PLC components or converters for activating the conveyor system. At the working level, the middle section, a tunnel-like construction is planned, which allows for flexible adaptation to customer requirements. Six plates fastened directly on the base frame make it possible to connect customer-specific conveyor belts or other conveyor systems directly to the plug-and-play solution. The control panel of the IRC5 control unit is also on this level, mounted on a side beam of the structure. The control panel can be mounted on any one of the four corner beams of this level as required. Also found on the working level is the FlexPendant and the mechanical interface for the conveyor system. Electrically monitored service doors ensure compliance with the strict safety requirements. The robot stops immediately as soon as the door is opened. The system starts up again only after it has received confirmation through automated inquiry that all doors are properly closed Acrylic doors on the opposite sides (operator sides) provide the operators with a large area for viewing work processes. The heart of the plug-and-play solution the ABB FlexPicker 360 – is found on the upper third of the structure. The robot is inverted facing downward, mounted on the top crossbar. Mounting plates for cameras, e.g. for imaging and evaluation systems, electrical installations, pneumatics, etc., offer customers individual equipping possibilities. A hinged flap with lock also secures access to the robot. The system’s metal facings are variable and symmetric. Customers have nearly unlimited options for the design and colour. All side panels are equipped with friction closures and are therefore easy to dismantle for servicing and maintenance. The panels on both operator sides are designed as doors and flaps. A wide range of options are planned such as an integrated break drawer, mounting plates for pneumatics and electrical installations, panel PCs and ABB PickMaster Software. The Picker-System Solar will be available for sale throughout Australia from ABB Certified Robot Partners from December 2008.